Historic Marker at the Homesite of Jesse Head. Author's Collection. Postcard of Jesse Head. Ky. Hist. Soc. 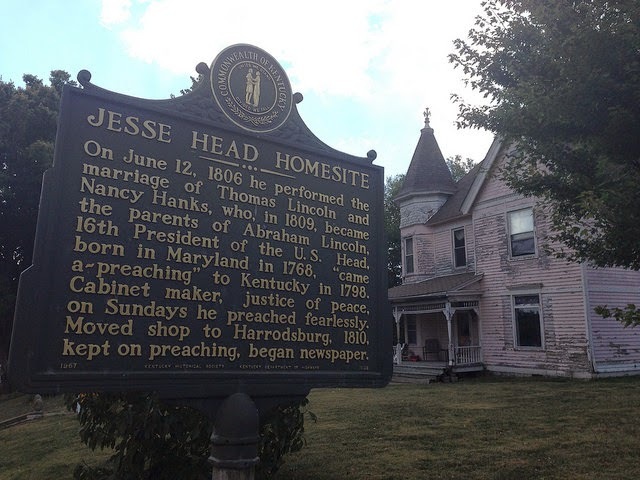 A block or two off of Springfield's Main Street is the homesite of Jesse Head. Though the home is long gone, replaced in a prior century by a rural Victorian which itself has seen better days, the once-occupant of the site is uniquely tied to history. One of Springfield and Washington County's greatest claims is their relationship with Abraham Lincoln. It was in Washington County that Lincoln's parents, Thomas Lincoln and Nancy Hanks, were wed in 1806. Three years later, the Great Emancipator was born in nearby Hodgenville. 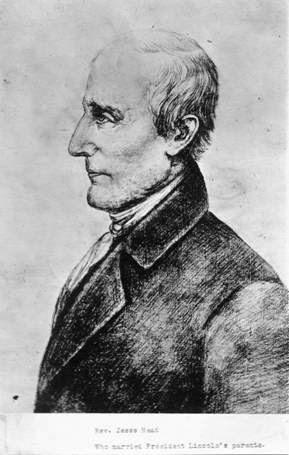 The preacher who wed the two was Jesse Head. On June 12, 1806 he performed the marriage of Thomas Lincoln and Nancy Hanks, who, in 1809, became the parents of Abraham Lincoln, 16th President of the U.S. Head, born in Maryland in 1768, "came-a-preaching" to KY in 1798. Cabinet maker, justice of peace, on Sundays he preached fearlessly. Moved shop to Harrodsburg, 1810, kept on preaching, began newspaper.